I need to export names corresponding to each polygon. Unfortunately when I save as KML file and open in Google My Maps, I can see only polygon boundaries, therefore I need to name them. The info is in a column in the attribute table. 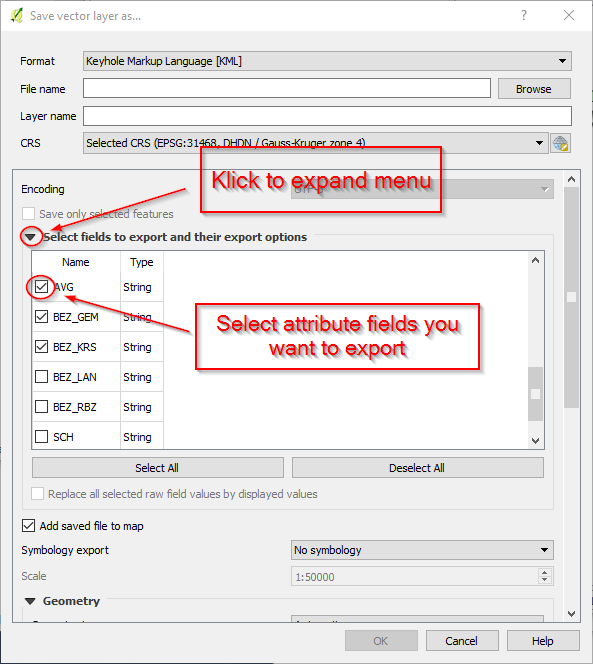 In the newest version (I used QGIS 2.18.9) if you right-click on the layer -> "Save As..." you can toggle "Select fields to export and their export options". There you can select all the fields you want to export. Optional: In the Save As-window - Scroll down to "Datasource Options", you can add the selected field name to "DescriptionField" or "NameField". For example if you checked the field "ABC123" and you enter "ABC123" in the NameField, the ABC123-data will have "Name" as the collumn-title in the exportet layer. I have found a solution to my issue and I would like to share it. I managed to export attributes (up to two) in the "save as" window when saving a vector layer. Set as "relativeToGround" the "Altitude Mode"
The kml xml schema does not have a tag for labeling polygon features only placemarks = points. A workaround for doing this is to create a new point layer from polygon layer and in the Save vector layer as dialog define the labeling field in the NameField text box. Once you have both kml creted in GE, select File>Open to add both kml in. I have had the same problem with a layer consisting of vectors that I want to display in Google Earth with attributes. I found that I needed to save as ClampToground. Then in "Datasource Options" only put the name of the field you want as the primary display name under "NameField." Leave "Description Field" blank. Saved like that in Wein and all the fields with data come up in a table in Google Earth. Google Earth will label the polygons if you follow this easy route: In "save vector layer as" and under Encoding select the dropdown at "Select fields to export and their export options" then check the boxes next to the fields you want to export to Google Earth. Next, select "ClampToGround" and under that remove text from "DescriptionField" and type in the exact name of the field (checked above) to "NameField" that you want for the in the drop-down Google Earth list. The field you chose for the NameField will appear in your list of polygons in Google Earth and when you select the polygon the other fields will appear in a pop-up box. Google does not label polygons but it does label points. In order to have a label in google earth for the Points you need to fill the column name (of your attribute table in QGIS) you want into the NameField in the save as menu from the layer within QGIS. Not the answer you're looking for? Browse other questions tagged qgis shapefile google-maps kml attribute-table or ask your own question. 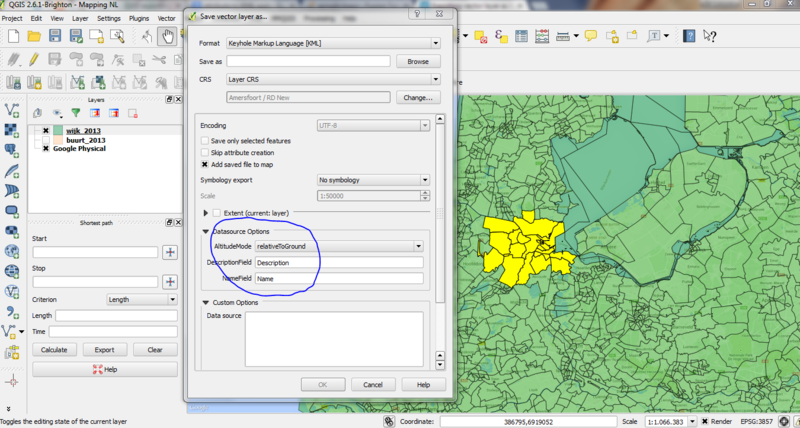 QGIS Not Importing ExtendedData from Self-Exported KML? How can I get a KMZ file with image to show in Google My Maps? How to hide/suppress and rename/alias fields when exporting to KML? Preserving attributes of KML file when loaded into QGIS?